The job I was applying for turned out to be a volunteer position with “perks”. How do we measure our worth as volunteers? I recently applied for an aquafit instructor position at the YMCA in my town. I’ve fallen in love with aquafit … the workout it provides ROCKS if you do it right and it’s low impact enough to keep my arthritis at bay. But in true Pursuit of Happyness style, what I had assumed was a paying job turned out to be a volunteer position with the possibility of earning a FREE YMCA membership (a $715 value) if I can commit to 3 hours of volunteering/week. At first glance, the offer was very appealing. As part of my Save-at-Home-Mom savings strategy, I’ve sacrificed having a Y membership and only make use of their facilities when admission is free. being able to get the laundry and shopping finished during the week so that we can enjoy more family time on the weekends! If this gig was a straight up exchange of volunteer time for the perk, I’d jump in a jiffy! Well, more like a labored lunge against the resistance of the water – that’s what aquafit is all about! A $715 YMCA membership is well worth 12 hours of volunteering each month for me. Besides, it’s tax free income, of sorts, and is a good motivator to give back to the community a little. It’s the 48 hours of training BEFORE being eligible to volunteer that’s the deal breaker. Turns out I’d need to attend 6 full day training sessions and pay almost $100 for textbooks before being able to set foot on the pool deck as a volunteer. That kind of time commitment is a complete deal breaker for me – sorry Will, I just can’t pursue my happiness like you did! I’d need to attend theory and practical courses from 8-3 pm each Saturday and Sunday for 3 consecutive weekends with 50 km of travel each way. I can only imagine how much it would “throw off” our family routine in terms of homework, cleaning, shopping, and good ole family fun for me to be away for 3 weekends in a row, WITH the family car, taboot! Ironically, our children would have to miss 3 swimming lessons at the YMCA during those weekends. Fail. When faced with a decision about the time vs. benefit ratio, I quickly calcula-guessed how much time I’d be spending to earn the FREE membership and came up with a staggering 168 hours of volunteering for a $715 perk. Sadly, I decided to pass. My earning potential with some of my other casual gigs far exceeds the $4/hour I’d be “making” and I’m better off logging some paid hours elsewhere and simply paying the $6.50 guest fee at the YMCA if I really want to go. I’ve been fortunate enough to find lots of little ways to earn money from home. More on that in another post, soon! Opportunities [exist] for save-at-home parents who have made sacrifices as part of their savings strategy. But it does bring to light the opportunities that exist for save-at-home-parents who have the time to volunteer in exchange for products and services that they might have sacrificed as part of their savings strategy. The “your time for our product/service” business model can benefit both enterprises AND individuals and I’ve had opportunity to take advantage of several FREE perks in exchange for my volunteer time over the years. Where to Volunteer in Exchange for FREE Stuff! Volunteering at the International Tulip Festival in 2000 with fellow alumni of the JET Programme (Japan Exchange and Teaching Programme). We taught kids to write their names in Japanese in 2 hour shifts and had the rest of the day to enjoy the festival! Theaters: ushers, ticket takers, even concession table staff are often volunteers at local theaters. What a great way to see a play or performance for free! Festivals: volunteers are often provided with a day pass and sometimes a free meal in exchange for volunteering at festivals. Gate security, staffing a booth or kiosk for an association that you belong to, ticket taking, etc. are a fun way to volunteer your time and have a chance to take in the sites, for free. Concerts: outdoor venues in particular require a large volunteer force for perimeter security and ticket taking. All volunteers automatically get to hear the concert, and some positions will put you front and center if you’re lucky enough! Conferences + Trade Shows: want to attend part of a conference or a trade show but don’t want to pay the entrance fee? Find out about volunteer opportunities. If you’re there to network, try to volunteer at the registration desk! YMCA/YWCA: for those willing to put in the training and weekly volunteer hours, a FREE membership really is an amazing perk! The Olympics: that’s on my bucket list! 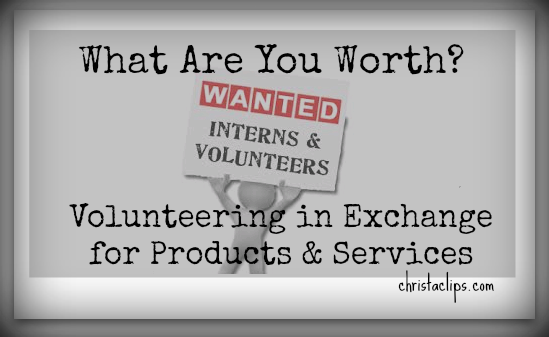 Posted on February 3, 2014, in Christa Clips and tagged Christa Clips, Exchanging Volunteer Time for Products & Services. Bookmark the permalink. 2 Comments. It’s National Volunteer Week! For parents who have sacrificed their own hobbies and activities for the sake of the family budget, finding a way to exchange your time & talents in exchange for a perk might be a something to consider.